Here's a superb new online slots game from the guys over at Eyecon Gaming. Be prepared for all things gothic of this game! It’s an abundance of everybody’s favourite Halloween characters. Join in the fun with these 5 reels (25 pay lines) online slot game. Howling Fun is a creepy collection of freaks with an eerie, but comforting feel. The background displays a haunted-looking grand castle built strongly beneath an illuminating full moon! Have your wits about you and feel the hairs go up on your back of the neck as you are invited into the unknown that presents in the witching hour. 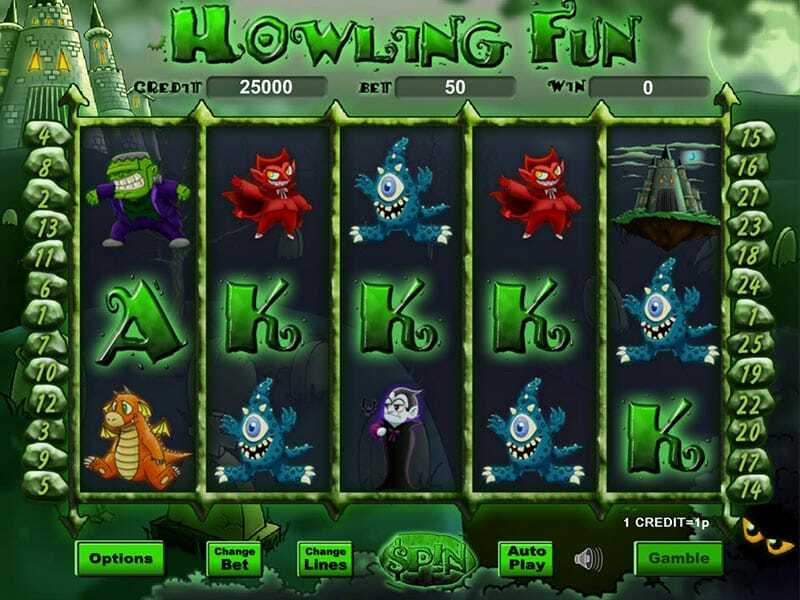 You can also enjoy Howling Fun on autoplay, making it scarily easy. Escape into a world of make-believe and mystery, set your bets and start winning with this themed fruit machine game. 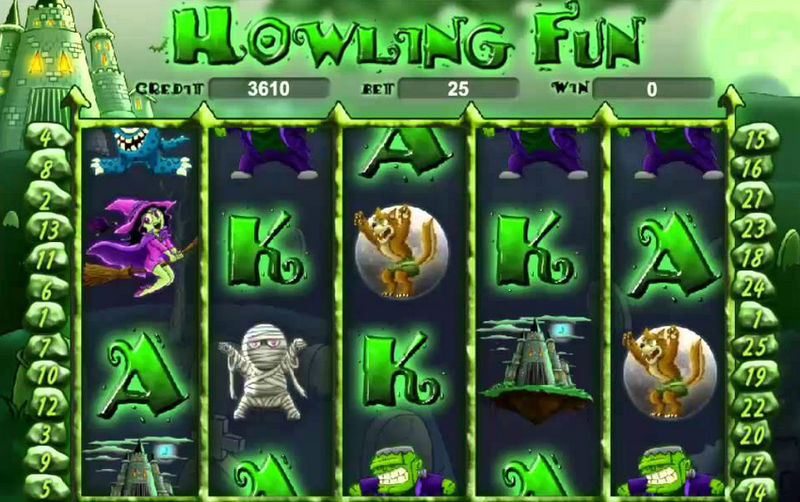 The freakish theme is continued throughout this online slot game. The symbols used by Eyecon include a skull (lit up ferociously with candlelight); a wicked witch and an evil looking monster. Halloween’s favourite friends Frankenstein and Dracula are also present. Another symbol is a black cat – not always unlucky though. Set a stake that right for you from a choice of £0.01, £0.02, £0.03, £0.04, £0.05, £0.06, £0.08, £0.10, £0.15, £0.20, £0.25, £0.30, £0.40, £0.50, £1 or £2. Then have the choice of lines that are played between 1 and 25. Depending on how outlandish you are feeling, you can choose your own bets. You can get your hands on some great winnings with the gamble bonus game option which enables you with the chance of doubling your winnings (by selecting the yellow or blue flame). This can reach a maximum of £32,000! The Wilds symbol is shown through a red devil who presents on reels 2 and 4. The devil symbol substitutes all the other symbols apart from the castle and the Mummy and they double the winning prizes. The castle acts as a scatter – it can appear on reels 3,4 and 5 and will guarantee 15,20 or 25 free games. Free spins can be retriggered up to 15 times in a row! Get 3 (or more) of the mysterious Mummy scatter to receive a prize. This scatter triggers up to 100x the total bet for each scatter picked.